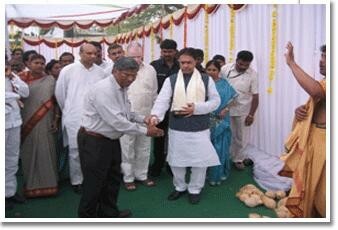 Bhoomi Pooja of buildings of SKPP Horticulture Polytechnic, Ramachandrapuram was celebrated on 9.1.2009 was performed by Sri K.R.Suresh Reddy, Hon’ble Speaker, Legislative Assembly, A.P. and Sri P.Subash Chandra Bose, Hon’ble Minister for Social Welfare, Govt. of A.P., Sri Gollapalli Suryarao, Minister of Small Scale Industries, Govt. of A.P., Sri M.B.Buddha Prasad, Hon’ble Minister for Animal Husbandry, Govt. of A.P. have graced the function.